Bit of news, for @metrolosangeles watchers: Chief planning officer Martha Welborne has left the agency for a job with Disney. Martha announced her resignation recently to become the Senior Vice President, Real Estate & Global Facilities for Disney; here’s their news release that was issued today. Martha has been with Metro since 2010 and has always been a friend of this blog. On behalf of everyone, I’d like to congratulate her on the new gig and thank her for a lot of great work in a really demanding job at Metro. 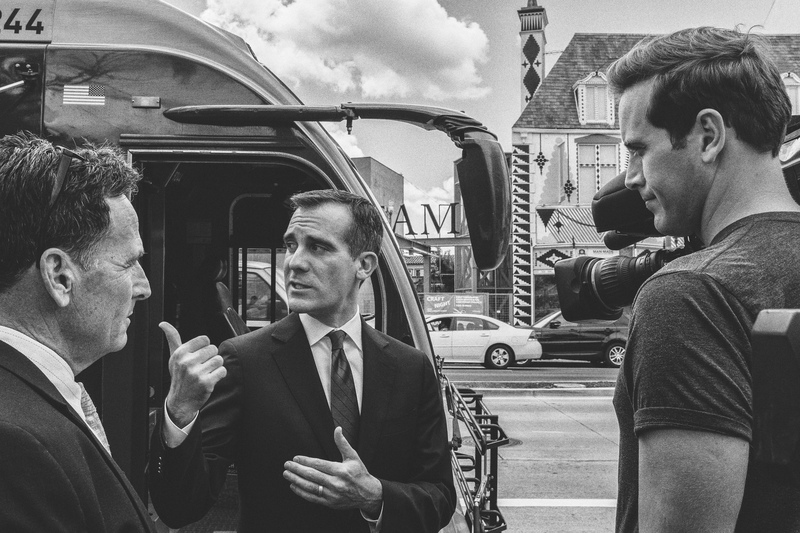 Mayor Garcetti at the opening of the Wilshire peak hour bus lanes last year. Photo by Steve Hymon/Metro. A sprawling story about a sprawling city/region and its long-time battles against traffic. As you might have guessed from the headline, the story focuses on Los Angeles Mayor Eric Garcetti and his support for more transit and streets that better accommodate pedestrians and cyclists via the city’s new mobility plan. The reporter captures a lot of the trends that have been written about locally and talks to many of the major players. It’s a long read that I do think captures the crux of what’s happening around our county — we’re trying to find alternatives to getting around besides driving. The reporter also strikes a skeptical tone that traffic can be tamed without a huge expansion of congestion pricing — i.e. charging motorists to use busy roads at their busiest of times. My reaction: It’s an article worth reading, although the Garcetti-Che Guevara comparison should have been revolutionized by the delete key. I suspect that Che, if confronted with L.A. traffic, would have been sympathetic to more and better public transit. Or he might have simply suggested that the state buy everyone a motorcycle and that’s that. I do think it’s worth emphasizing that many elected officials, activists and groups have pushed our region in the direction that it’s going. The current slate of Metro projects under construction were funded because of the passage of Measure R in 2008 with support from then-L.A. Mayor Antonio Villaragosa and many, many others. Metro (with Garcetti as a Board Member) is looking at a potential ballot measure this November that would raise the sales tax to fund a different slate of projects (the list is scheduled to be available in March). I also think it’s debatable whether L.A. is the trendsetter when it comes to remaking cities transportation-wise — as the article sometimes suggests — or whether we’re in catch-up mode. My three cents: we weren’t the first county to embrace light rail, subways, ExpressLanes, downtown makeovers, bike lanes, river revitalizations, the Summer Olympics, etc. But we are now pursuing them in a big-time way across the second-largest metro area in the U.S. That is certainly worthy of attention. The agency replied yesterday to the request by Azusa, Azusa Pacific University and the development firm Rosedale to delay the opening of the APU/Citrus College Station by four months due to the unfinished extension of Citrus Avenue (the work is being done by Rosedale). Metro says all six new stations on the Gold Line will open March 5 as was planned and offered some mitigations to help passengers reach the final station. More at this Source post. Another future transit-oriented restaurant in DTLA. The burger/hot dog/sandwich/shake place started in Madison Square Park in Gotham in 2004 and has since spread to several states, mostly in the eastern half of the U.S. along with a location in Vegas. Shake Shack has received a ton of press coverage for its relatively healthier version of fast food; here’s a really good story in the New Yorker that also looks at McDonald’s slipping fortunes. As for DTLA, it’s impressive to see the number of retailers and restaurants that continue to be attracted to the area. I still feel the ultimate litmus test for DTLA’s resurgence will be the arrival of an Apple Store. The new Shake Shack will open in 2017 and be at 8th and Hill, a short walk from 7th/Metro Center Station that serves the Red, Purple, Blue and Expo Lines, as well as stops for many buses run by Metro, DASH and others. The Counter is also nearby and currently offers a tasty burger experience, IMHO, although I think In-N-Out’s Double-Double still is the burger that rules them all among the fast/convenient food places. For those who have had both Shake Shack and In-N-Out, which is best? The pilot program in NYC will allow groups representing seniors without smart phones to request rides to medical appointments with Lyft. Another move seemingly designed to further ingrain ride hailing into the everyday economy. Related: California is fining Uber $7.6 million for failing to report required data, says the LAT. Uber says it will appeal the fine. No pads necessary for this “exclusive” interview, in which Kroenke describes himself as a “victim” when discussing the prospect of staying in St. Louis. (Here’s a more skeptical look at the move by the NYT’s Michael Powell). Perhaps most interesting, Kroenke says the campus around the new Inglewood stadium will include bars and places where fans of other NFL teams can watch those games. I hope there’s a place where Steelers fans can drink cheap grog while watching the Rams avenge their loss in Super Bowl XIV. No thanks. I can watch my beloved Bengals — a team that has been legitimately victimized — with other likeminded people at the 5 Line in Eagle Rock (convenient to the 80 Local and 780 Rapid, btw, for any Cincy fans who drink away their emotional duress). In the meantime, the Rams will be playing in the Expo Line adjacent Coliseum — with games easy to reach from Santa Monica, the Westside and DTLA. That’s pretty cool although cray-cray that the NFL previously scheduled the Rams home game against the Giants to be played in London. Like no one at NFL HQ knew the Rams were moving to L.A. Ridiculous. 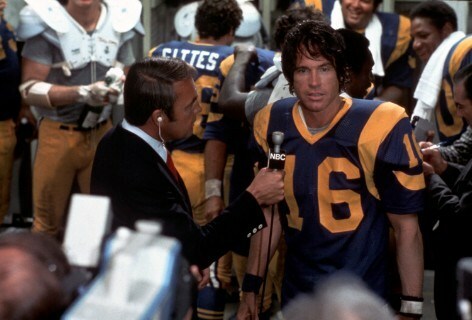 Update: Source reader Daywalker rightly points out that my list of potential Rams QBs should have included Joe Pendleton. Totally agree — and didn’t he beat the Steelers in the big game? Pendleton in disbelief that he survived (literally) beating the Steelers. Credit: Paramount Pictures. Things to listen to whilst transiting: A really interesting Fresh Air interview from 2002 with David Bowie. Smart and funny, Bowie has some surprising things to say about his work, early characters and performing live. Now that the Rams have been selected, I can say. “Booom!” Not a Rams fan really, but AFC (Arsenal Football Club; yes London is Red). This makes the Inglewood site so much more exciting for sports fans a infrastructure nerds like me. *I hinted at this in the original post regarding Stadiums in the UK. Emirates Stadium. where The Gunners play, was built opened in 06 after they tore down Highbury and is state of the art. When I say state of the art, not just the experience inside, but also how the match day affects the surrounding environment. Kronke was also responsible for making the stadium “redder” so the fans to feel at home and to intimidate the likes of Failsea, I mean Chelsea…. He’s seems concerned about getting everyone in, especially as he discusses how L.A. is a melting pot of fans. So hopefully he can use the Emirates as an example. “Wiki: The Emirates Stadium is served by a number of London Underground stations and bus routes. Arsenal tube station is the closest for the northern portion of the stadium, with Highbury & Islington tube station servicing the southern end. While Holloway Road tube station is the closest to the southern portion, it is entry-only before matches and exit-only afterwards to prevent overcrowding. Drayton Park station, adjacent to the Clock End Bridge is shut on matchdays as the rail services to this station do not operate at weekends nor after 10 pm. £7.6 million was set aside in the planning permission for upgrading Drayton Park and Holloway Road; however Transport for London decided not to upgrade either station, in favour of improvement works at the interchanges at Highbury & Islington and Finsbury Park, both of which are served by Underground and First Capital Connect services and are approximately a ten-minute walk away. Driving to the Emirates Stadium is strongly discouraged as there are strict matchday parking restrictions in operation around the stadium. An hour before kick-off to one hour after the final whistle there is a complete ban on vehicle movement on a number of the surrounding roads, except for Islington residents and businesses with a road closure access permit. The parking restrictions mean that the stadium is highly dependent on the Underground service, particularly when there is no overground service in operation. Industrial action on a matchday in December 2012 forced Arsenal to reschedule the match for the following month. That being said, this article claims the Rams location will be one of the best in the world. Its got some stiff competition from its cousin, but its also proof that Kronke is thinking, and could hopefully create something that will get LOTS of fans to games with ease…. Like the potential AFC match that will most likely happen there and i’d take metro to!!!!!!!! On the deep and heavy question, I’d say Shake Shack is much superior to In ‘n Out. Of course they’re more expensive too. In general I’m generally not a fan of chains but I think this would be a good addition.